You’ll impress quite a few family members with this grilled tomahawk ribeye steak. This ribeye steak is an extra thick (think 1 1/2-2″) prime ribeye with a portion of the rib bone still attached which is perfect for this method of cooking. Here’s how you season a good ribeye steak: Salt, black pepper, and maybe some garlic powder. Not much else is necessary, because this monster of a steak already has all the beefy flavor you want. While the steak is sweating through the rub, it’s time to prepare the grill! Set it up for two-zone cooking- meaning one side of the grill is directly over the heat source, while the other takes advantage of radiant heat. When the grill is up to temp, grab your favorite AP steak rub and give the steak a light coating. Then throw it on the direct heat side of the grill and sear for 5 minutes per side. Give the steak a twist halfway through each side for some of those impressive grill marks! Once all the searing is done, move the steak over to the indirect heat- on a raised rack if possible. Start monitoring internal temperature using a meat probe thermometer. Target internal temperature is 125ºF for medium rare (adjust to your deserved doneness). Place a shallow aluminium pan under the steak, and add a stick of butter, fresh rosemary and thyme springs, and a quarter cup of olive oil. Baste the steak every few minutes with the mixture while it still cooks. When it hits your desired temperature, remove it from the grill and let it rest for 10 minutes. 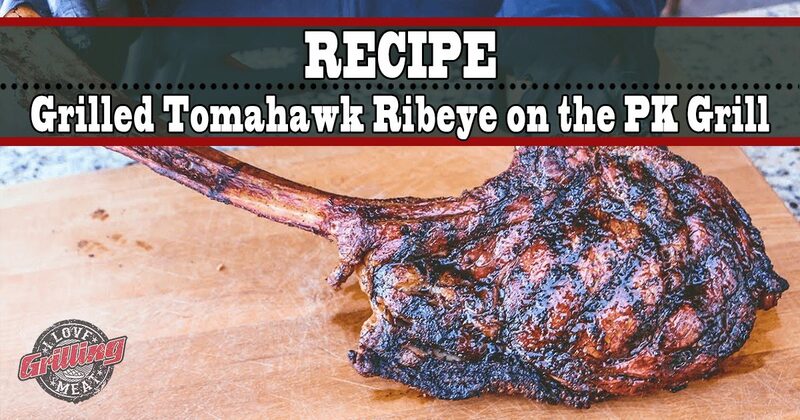 Slice the grilled tomahawk ribeye, or serve it with the bone still attached for a spectacular presentation.